I. 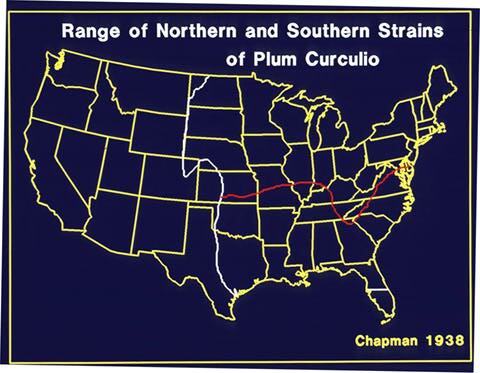 Introduction: The plum curculio (PC) is native to North America and is primarily found throughout the mid-western and eastern apple growing regions. Most commercial orchards are relatively free from resident populations, but can be infested by adults migrating in from adjacent hedgerows and woodlots. II. Hosts: In addition to apple, the PC attacks nectarine, peach, plum, cherry, apricot, pear, quince and blueberry. The principal native hosts include American plum species, larger fruited hawthorns (Crataegus spp.) and wild crab apples. III. Description: The adult beetle is about 1/5 inch (5 mm) long, dark brown with whitish to gray patches, and has three pairs of humps on its wing covers; the middle two are most discernible. The beak or snout is about 1/4 to 1/3 the body length, projecting forward and downward from its head. The PC egg is small, elliptical and pearly white. The larva, which feeds internally in the fruit, is yellowish white with a well-defined brown head capsule, and no legs. When fully grown, the larva is about 1/4 inch (6-7 mm) long, curved, cylindrical and tapered slightly at each end. The whitish or cream-colored pupa is about 1/5 inch (5 mm) long and is found in the soil. IV. Biology: The biology of PC is similar for most deciduous fruits, although the timing may be slightly different. The adults overwinter in the top few inches of leaf litter in nearby hedgerows, trashy fields and woods (especially on the south edge of an orchard). The adults initially appear in apple orchards during bloom. Most beetle activity occurs during the first warm period after petal fall, when the maximum temperature is 70°F or higher. Periods of cool, rainy weather with maximum temperatures below 70°F are not suitable for adult activity. Adults can be found in orchards for 5 to 7 weeks. Egg laying activity starts once the fruit begins to form, with egg hatch occurring after 7 days. In successfully attacked hosts, the hatching larva burrows into the fruit's center, where it makes large irregular cavities. Fruit that are successfully attacked by larvae are prone to drop prematurely. After 14-16 days within the fruit the larvae exit and enter the soil where they form a pupation chamber for an additional 10-12 days before transforming into adults. New adults can appear in the orchards in mid- to late- July with emergence continuing until early September. In September and October adults begin seeking overwintering quarters. There is only one generation per year in the mid-Atlantic region. There is a second generation in eastern Virginia and southward. V. Injury: The adults can injure the fruit in two ways during the early season: 1) feeding injury and 2) egg laying (oviposition) injury. 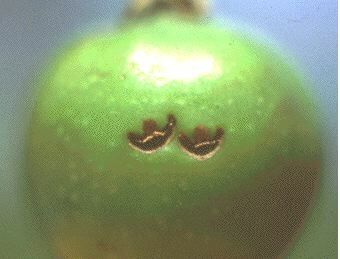 Feeding punctures consist of small, round holes extending 1/8 inch (3 mm) into the fruit; egg punctures are distinguished by a characteristic crescent-shaped cut that partly surrounds the sunken egg. As the fruit matures both types of injury become corky in appearance. Slight feeding may occur on petals, buds, and blossoms, but there is little injury until the fruit is available. Early-blooming varieties are the first to provide suitable locations for feeding and egg laying. 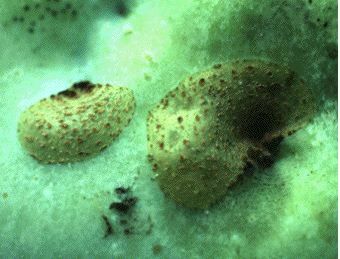 During the egg laying period, the female PC initially eats a small hole in the fruit (Kenner Love, VCE, photo), deposits an egg, and then makes a crescent-shaped slit just below the site with her snout. It is believed that the slit relieves pressure from the rapidly growing fruit and helps the hatching larva to become established. Egg laying scars appear on fruit at harvest as crescent-shaped corky areas resembling the letter "D". PC larvae rarely become established after eggs are placed in apple, although apple is frequently attacked. 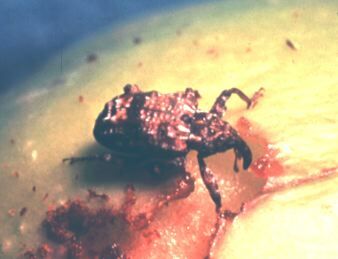 Apple fruit are much larger than this insect's natural host fruit, and larvae are crushed by the expanding fruit. Development is more successful in peach and smaller fruit hosts such as plum, hawthorn and blueberry. Adults which successfully emerge in mid-summer can again feed on fruit. This injury appears as small, soft, irregular holes, usually near the calyx of the fruit (Plate 7). The injury usually occurs in orchards that have high amounts of egg laying injury. Adults can average over 100 feeding and/or egg punctures during their normal life. VI. Monitoring: The PC is difficult to monitor. There are presently no effective traps to monitor the movement of adult PC into the orchard. The best means to monitor PC activity consists of detecting fresh feeding or egg laying punctures; the most important period to monitor is between bloom and about 2 weeks after petal fall. A visual inspection of 10 fruit per tree on 1 tree per 3-5 acres (1.5-2 hectares) is recommended. Observations should be made on trees adjacent to hedgerows, trashy fields and woods. Adults can be monitored by using a beating tray (a cloth attached to a wooden frame) and a rubber mallet used to jar the limb. The best time to monitor adults is in the evening under humid, warm temperatures (above 70°F). There are presently no established thresholds for PC. 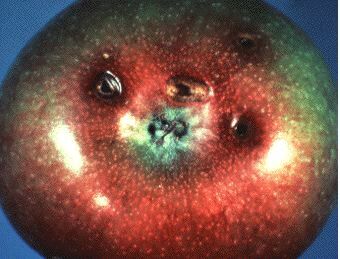 Since the PC has the potential to injure 100% of the fruit in an untreated orchard, an application of an insecticide should be applied immediately if any evidence of fruit scarring from feeding or egg laying is observed. From work conducted in Massachusetts, a combination of border row sprays and full orchard sprays may be used. A New York recommendation suggests maintaining chemical protection for 340 degree days above 50 degrees F after petal fall. This corresponds with the predicted termination of the immigration period of adult curculios. Amiss, A. A. and J. W. Snow. 1985. Conotrachelus nenuphar. p. 227-235. In: P. Singh and R. F. Morse (eds). Handbook of Insect Rearing. Vol 1. Elsevier NY. 488 p.
Reissig, W. H., J .P. Nyrop & R. Straub. 1998. Oviposition model for timing insecticide sprays against plum curculio (Coleoptera: Curculionidae) in New York State. Environ. Entomol. 27: 1053-1061. Zhang, X., S. Luckhart, J. Tu and D. G. Pfeiffer. 2010. Analysis of Wolbachia strains associated with Conotrachelus nenuphar (Coleoptera: Curculionidae) in the eastern United States. Environ. Entomol. 39: 396-405. Zhang, X., J. Tu, S. Luckhart and D. G. Pfeiffer. 2008. Genetic diversity of plum curculio, Conotrachelus nenuphar (Herbst) (Coleoptera: Curculionidae) among geographical populations in the eastern United States. Ann. Entomol. Soc. Am. 101: 824-832. Zhang, X., and D. G. Pfeiffer. 2008. Evaluation of reproductive compatibility of interstrain matings among plum curculio populations in the eastern United States. Environ. Entomol. 37: 1208-1213.